Unique egg head help kids learning to identify and express their feelings in a fun, and funny way. story book included. Looking for a fun new way to teach kids about emotions and expressing their feeling? The creative team at Hape have created these quality crafted wood egg-heads to help! Each egg is uniquely painted to help children learn to identify and express their feelings in a fun and humourous way. Each set of Eggspressions comes with a story book, to support families and educators to engage children in open communication and further encourage social, emotional and language development. As children grow and develop so do their expressions. This brilliant educational wooden eggpressions by Hape will encourage your child to explore their own and learn new expressions to understand others feelings. 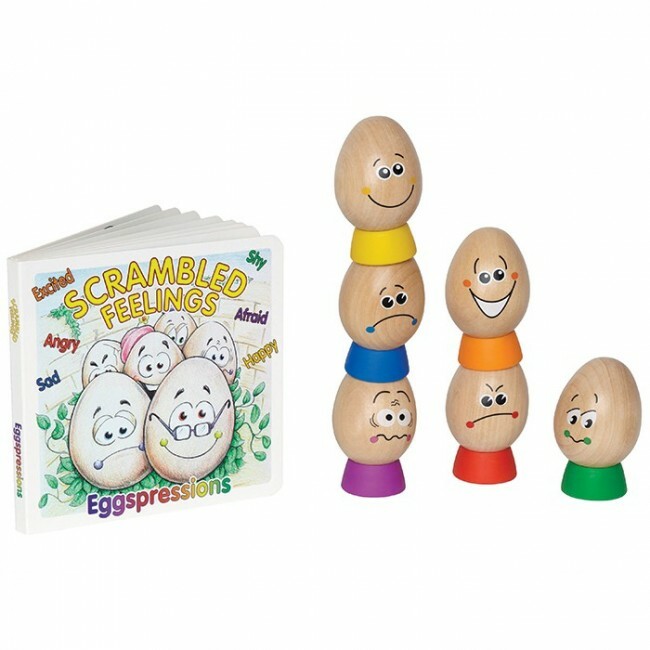 A beautifully illustrated board book "Scrambled Feelings" is also included to encourage your child to explore the eggspressions of happy, sad, angry, excited, afraid and shy. Beautifully packaged it includes 6 x eggspressions, 6 x eggspressions cups and 1 x eggspressions "Scrambled Feelings" educational board book.